Sometimes athletes just don’t hear what their coach is saying . . . whether you are guiding their diet, training or performance, make sure they hear you. You can’t hear. Honestly if you have a high school boy who will eat lean protein, vegetables and clear water for his life, is that pretty good advice. Having said that, let’s work this out. There are times in your life when you will not have park bench workouts and kingly eating. In other words, a reasonable diet and reasonable workouts. How much of your life should be like that? I think, most of the time. There are times when maybe you have a reunion coming up. You want to ratchet down your diet, so that would be the warrior diet, a kind of a tough, warrior diet. I suggest you still train reasonably then. I bet you could do that once or maybe twice a year—maybe once a year for most of us. As an athlete, there are times I have to ratchet up my training. Say, I’m going to set myself up for the Nationals or getting ready for the State meet. Okay, we just slid over to a bus bench workout. When I’m coaching you, I expect you to show up at 8 o’clock on Friday and I want you to win the State meet. Why? That’s what I told you to do. I’m the coach and I’m always right. It actually works out when you say it like that. About twice a year, I can probably put myself onto a peaking program and ride it up on the exercise side. They’re tough workouts, but I better have a reasonable diet. Marty Gallagher thinks this. Tommy Kono thinks this. That’s what they hear. How often can you do that? Years ago when I was in college I had friends who were bodybuilders. When they were getting ready for a contest, I went to help them train. You would think it was because of my genius, but no, it was literally to help them train. One guy was on just lettuce for a few weeks. That’s all he ate. When trained, he would do a set and fall on the floor during his rest period. My job was to pick him up and get him back to the incline bench. He would then kind of wither away. He didn’t hit the ground every time, but let’s say for half of the workout. The rest of the time he was just a drooling mass. How often can you do that? Here’s the thing. That’s what your clients think. That’s what my athletes think. You don’t have to worry about dieting when you run the 400 meters. I’ll take care of that for you. Eat the biggest lunch you can. Don’t worry about it. You’ll see it again. Chip Conrad and Dan John show you how to not only get better results from your training, but also rediscover your passion for it. In these two presentations, they discuss motivation, goal-setting and provide a principles-based approach to training to help you reach those goals as quickly as possible. 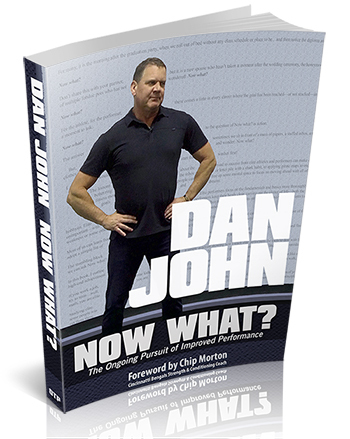 Dan John has been competing and lecturing about the art and science of strength coaching for 30 years and considers Now What? to be his best work. This book is the companion to his Now What? video, and the related books Intervention and Can You Go. The ever-creative Chip Conrad challenges us in Why on Earth? Excerpts from our Sweet Chant of Frantic Power to think deeper about why we need strength, why we want it, and how to share it.